Conserving space is important, whether you're on a bike or in a small apartment. Thus, I like things that are stackable, like Dowco's Iron Rider luggage. Six different bags with six different purposes are included in the Iron Rider system. All are ready to strap and stack on your bike alone or together in numerous combinations. 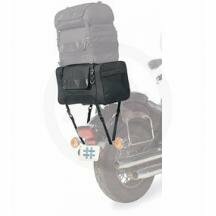 If you're using a couple of bags, they are designed to connect to each other, meaning you'll only have to strap one bag down to the bike. The Iron Rider overnight bag is one cog in this machine. Use it in tandem with other bags or on its own to carry everything you need for an overnight trip. Constructed of 1680 polyester (like its brothers and sisters), the overnight bag is 14 inches by 10.5 inches by 9 inches. Interior compartments and side compartments give the rider options of accessibility, and a rain hood will keep your precious possessions dry. The overnight bag has a rigid construction to permit stacking without crushing your luggage or whatever you've put in it. This solid construction also gives you the liberty to leave some space for items you might want to pick up along the way, and a removable plastic-molded handle and shoulder strap makes it easy to lug your stuff around. There are a lot of luggage options out there, but if you think you might want to assemble the Iron Rider set, this is a good place to start. The ability to combine any of the six bags to suit your travel needs is unique, and the 2-year warranty will certainly give you time to collect the whole set.